Are you a fan of Buffalo Wild Wings? If so, you might be interested in learning a bit more about some recipes for some of the restaurant chain's more popular menu items. Eating out is expensive - cooking at home, not so much. Do you know how to make BW3 sauce? From classic buffalo wings to elaborate sauces - including Parmesan Garlic, Blazin' Hot, and Asian Zing, and other spicy flavors - read on to learn a bit more about Buffalo Wild Wings copycat recipes that you can make in the comfort of your own kitchen, on the cheap! Be sure to also check out our guides to cooking Cheesecake Factory and Benihana recipes at home! To make this sauce, combine one cup of Frank's cayenne pepper sauce, 1/3 cup of vegetable oil, one teaspoon of sugar, 1/2 teaspoon of cayenne pepper, 1/2 teaspoon of garlic powder and 1/2 teaspoon of Worcestershire sauce and 1/8 teaspoon of black pepper (coarse and ground) in a small pan, heating until the mixture is boiling. After letting it simmer, take it off the heat and let it cool. Now, blend together one egg yolk and two teaspoons each of cornstarch and water in a medium-sized bowl. Pour the cayenne pepper mixture slowly into the egg yolk mixture, blend well and cover. Refrigerate the sauce until you are ready to use it on your wings. Voila! The Buffalo Wild Wings medium wings are probably one of the more popular items on BWW's menu, and making the sauce at home is pretty simple. If you're not sure how to get the exact consistency, this recipe can be really helpful. Experiment a little - add or take away some things to find exactly what works best for you. If you want your wings to be less spicy, cut back on the cayenne. Easy peasy! Look out, garlic fans! This spicy garlic wing sauce is very, very similar to the sauce served at Buffalo Wild Wings. It has quite a kick, too. Garlic and spices - perfection! To prep the spicy garlic wing sauce, combine one cup of Frank's cayenne pepper sauce (honestly, Frank's is the gold standard, though you might have another brand you prefer - go for it, if so), 1/3 cup of vegetable oil, one teaspoon each of sugar and garlic powder, and 1/2 teaspoon each of ground black pepper, Worcestershire sauce and cayenne pepper. Combine all the ingredients thoroughly in a medium-sized bowl, cover and chill until you are ready to drizzle this goodness all over your chicken wings. If you want to tone it down a bit, ease up on the cayenne pepper. Also, you can use cloves of garlic instead of the garlic powder - more or less, depending on your taste. Buffalo Wild Wings' Asian Zing wing sauce is truly delish - and pretty darn easy to whip up. To make this tasty wing concoction, combine two teaspoons of cornstarch, four teaspoons of rice wine vinegar, 1/2 cup of corn syrup and 1/3 cup of sugar. You'll also need 1/4 cup of chili-garlic sauce, one tablespoon of soy sauce, one teaspoon of lemon juice, and 1/4 teaspoons each of ground ginger, minced garlic (or garlic powder) and salt. Combine the corn starch and rice wine vinegar in a bowl and set it aside. Next, combine the remaining ingredients and add your corn starch mix, combining thoroughly. Heat the mixture up on low heat and bring to a boil to thicken. Take the mixture off the heat and let it cool down, then refrigerate until you are ready to bathe your wings in it! 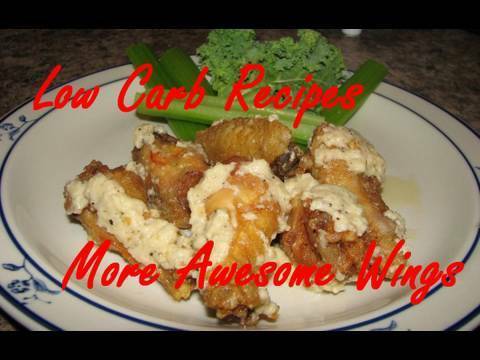 If you've tried Buffalo Wild Wings' Parmesan garlic wings, you know: They are fabulous! Making this one at home is ridiculously easy - you only need a handful of ingredients, so it's quick and tasty. To make the Parmesan garlic wings sauce, you'll need one cup of butter, one clove of garlic (or two, if you want a zestier flavor), 1/4 teaspoon of ground black pepper, one teaspoon of onion salt, and 1/3 cups each of grated and shredded Parmesan cheese, and mayonnaise. Combine all of the ingredients, heat and stir until the mixture is thoroughly combined. See? Super simple.